The more money the car costs, the more that people crash them, or the more they get stolen, the higher your insurance rate will be. It goes something like that. 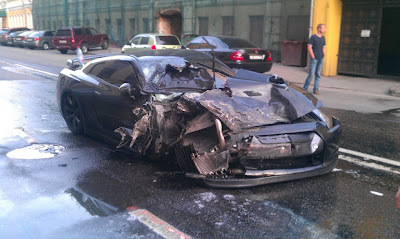 The replacement parts are expensive for the GT-R, so the insurance companies want more of your money to insure the car. The Nissan GT-R makes the list at #18 for the 20 most expensive vehicles to insure for 2012 based on the data from Insure.com. Insure.com commissioned Quadrant Information Services to provide a report of average auto insurance rates. We calculated rates using data for six large carriers (Allstate, Farmers, GEICO, Nationwide, Progressive and State Farm) in 10 ZIP codes per state. Not all models were available, especially exotic cars.